Deep Silver is looking to put a twist on the old adage "Something old, something new..."
Deep Silver, the publisher behind last year's tropical zombie FPS Dead Island, is hosting a rather unique competition to promote its upcoming sequel Dead Island: Riptide. One lucky couple from the United Kingdom that's looking to make things official and exchange wedding vows could possibly have their entire marriage ceremony fully funded by Deep Silver - provided it's zombie-themed, of course. "In return for becoming the official Dead Island Riptide zombie bride and groom," reads an announcement on the contest's Facebook page. 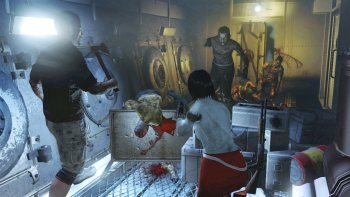 "Deep Silver will host a Dead Island Riptide-themed zombie wedding ceremony and send the winning undead couple on a luxury Caribbean honeymoon." If the idea of turning you and your fiancÃ©'s special day into one filled with friends, family, joyous celebration and a horde of brain-eating undead monstrosities (on top of a hopefully zombie-free tropical honeymoon), you can submit a YouTube video application to the Dead Island Riptide Facebook Page. The deadline for the contest is February 14th, and is limited to those living in the UK. For those more interested in the actual game, Dead Island Riptide is scheduled to release on April 23rd in North America and April 26th in Europe, for the Xbox 360, PS3 and PC.